Germany’s surplus on the current account of its balance of payments surged to a record level last year, reaching $285bn, or 8.5 per cent of gross domestic product. It is now overtaking the Chinese surplus as the largest trade imbalance in the world. Although the term “crisis” is normally confined to trade deficits, not surpluses, this imbalance is clearly causing major headaches, both inside the eurozone and globally. Not least, the surplus is causing problems for Germany itself. Nevertheless, the Merkel administration follows a longstanding German tradition in viewing it largely as a symptom of economic success, not failure. Both the government and the Bundesbank are resistant to lectures from foreigners on how to fix something that is not, in their view, broken. There is growing pressure from the IMF and the European Commission to take steps to reduce the surplus but, in the main, this has fallen on deaf ears in Berlin. The consequences of ignoring this quandary could be profound. Germany’s balance of payments was in small deficit when East Germany was being absorbed during the 1990s, but since then the surplus has been persistent. During the 2000s it increased sharply with the rest of the eurozone, largely because of improvements in German competitiveness following the Hartz labour reforms, and because of the unsustainable booms in peripheral eurozone economies. After the euro crisis, the German surplus with other eurozone economies shrunk, but the surplus with the rest of the world increased further. In 2015 the increase to record levels was driven by the fall in oil prices and the depreciation of the euro, which Germany says are temporary factors. However, we can also view the surplus through a definitionally identical prism, which is the gap between domestic investment and domestic savings. 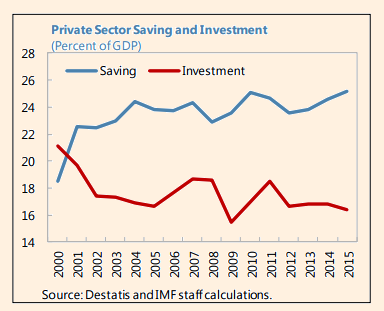 Here, it has been driven by very high private savings (caused by the ageing of the population), and very low corporate investment (caused by weak growth prospects in Germany compared to those overseas). The unusually large financial surplus of the corporate sector is the counterpart of half of the current account surplus. This looks persistent. Why is this a problem? Let us start from the global perspective. The German surplus is often viewed by New Keynesian economists such as Paul Krugman and Ben Bernanke as a detriment to aggregate demand in the rest of the world. This is increasingly difficult to eradicate through lower interest rates, which are already at the zero lower bound, or ZLB. Put simply, Germany’s net exports add to German GDP, while subtracting from GDP elsewhere. In a world characterised by secular stagnation, this can contribute to low global growth rates. One way out of this dilemma in normal circumstances would be for interest rates in the rest of the world to be cut, causing the German exchange rate to rise, and eliminating the trade surplus. But this is being prevented by the ZLB, and also by the existence of the euro, which prevents the German exchange rate from rising as much as it would have done in the old days under the Deutsche Mark. The IMF reckons that Germany’s real exchange rate is now 15-20 per cent undervalued, which is at the heart of the “problem”. Without the euro, Germany’s export sector would already have been hit very hard by a huge rise in the D-Mark. Now let us look inside the eurozone itself. The German view is that the surplus is the result of the underlying competitiveness of its trading sector, rather than from economic distortions that need to be eliminated. The implication is that other eurozone economies have a responsibility to correct their deficits by following Germany’s example on labour market reforms, and economic restructuring. There are some signs that this is working, with the halving of Germany’s surplus with other eurozone economies since 2006. Spain and Italy, for example, have now moved into surplus positions. The optimistic view is that this process of rebalancing within the eurozone can simply be allowed to continue until it is fully successful. But there are two major problems here. The first is that the rebalancing is happening mainly because domestic demand (and GDP) growth is being held down to very low rates in much of the eurozone, which restrains their imports from Germany. The trade rebalancing would look much less successful if all eurozone economies were at full employment. And the willingness of European electorates to tolerate subdued economic activity forever is questionable. The second issue concerns the financing of the trade imbalance within the eurozone. Much of this has been accomplished not by “healthy” private sector capital flows, but by official flows within the balance sheet of the European Central Bank. 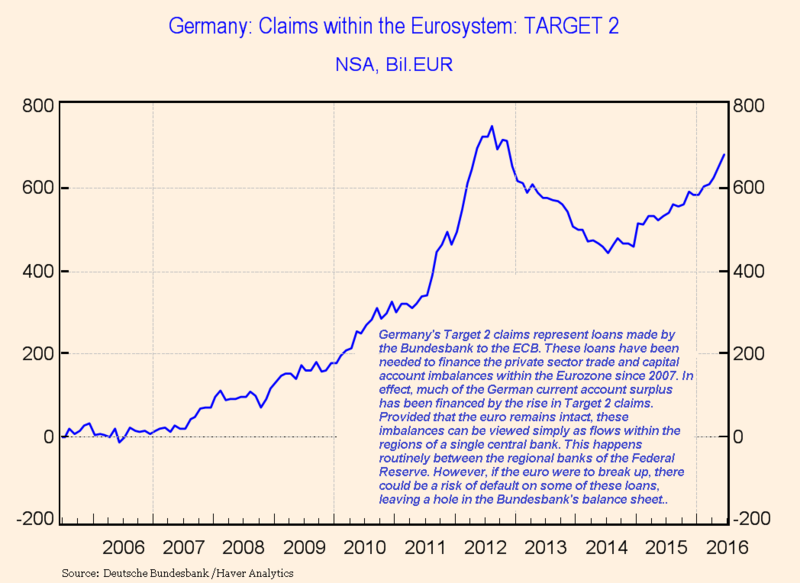 These flows, known as Target 2 flows, imply that the Bundesbank is building its assets (ie, lending money) versus the ECB as a whole, while the national central banks in countries such as Italy and Spain are building liabilities to the ECB. For as long as the euro remains intact, these Target 2 imbalances are irrelevant, but if the euro were to disintegrate, the German central bank would need to worry about potential defaults on Target 2 assets. And they are now very large, amounting to more than €600bn on the Bundesbank’s balance sheet. This has already become a political issue within Germany, and recently Target 2 imbalances have been rising despite a narrowing in the trade imbalances. Capital outflows from the eurozone periphery into Germany have more than offset the improvement in trade imbalances. So what can be done about all this? Both the IMF and the European Commission argue that Germany should now be taking action to reduce its external surplus. The proposals made by these and other agencies are mind-numbingly familiar to international economists: increased infrastructure spending to use the fiscal space in Germany’s budget; labour market reforms to expand the labour supply and increase long-term growth, thus boosting private investment; pension reform to reduce the need for precautionary private savings; deregulation of the services sector to increase productivity; and more rapid wage increases that would reduce Germany’s trade competitiveness with the rest of the eurozone. But Germany does not share the diagnosis, and is therefore unenthusiastic about the proposed solution. Despite increasing strains, the German authorities have expressed scepticism about whether the suggested reforms are either essential or effective in solving the trade imbalance. With only partial implementation of the reforms, the IMF still sees many years ahead in which the German current account surplus will exceed 7 per cent of GDP. This weekend the stricken Italian economy seems to be facing another serious banking crisis, which could result in further increases in Germany’s implied loans to the periphery, hidden within the central bank balance sheet. Some of these issues can be traced, directly or indirectly, to the German trade surplus. The peripheral countries in the eurozone have done a lot to correct their deficits, but they need more help from Germany before it is too late.